Walter Johnson was born in 1890 near The Old Kent Road in London. 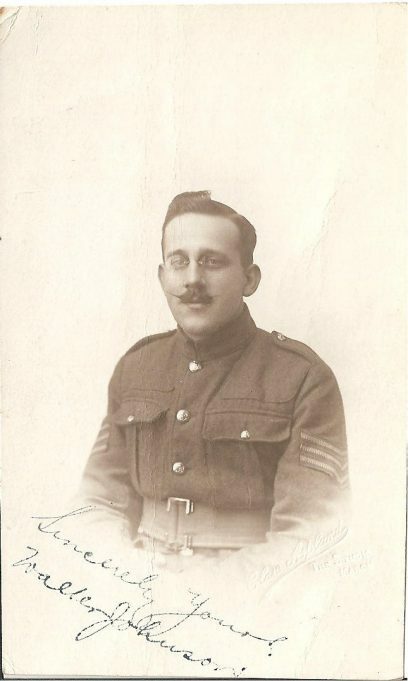 He served in the Army Medical Corps during the Great War, and he married Ethel MacPherson in 1918. The couple lived for a while in Leytonstone, where their first son was born, but they moved to South Benfleet early in 1923. The family stayed at The Hoy until their new home, a chalet bungalow situated in St Mary’s Drive, was ready. 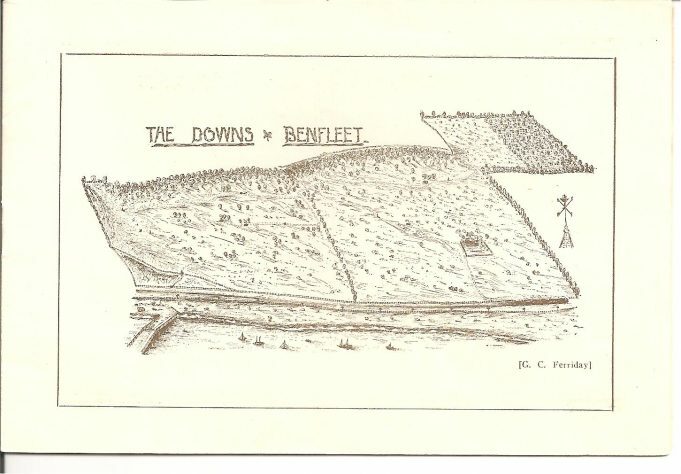 In an autobiographical memoir written in the 1990s, Walter’s eldest son Alec Johnson described his childhood memories of their arrival in Benfleet. Walter continued to work in London, commuting daily to his job at the Teacher’s Provident Society in the Euston Road, but he took a keen interest in local government and was to be deeply involved in village life for the next four decades. 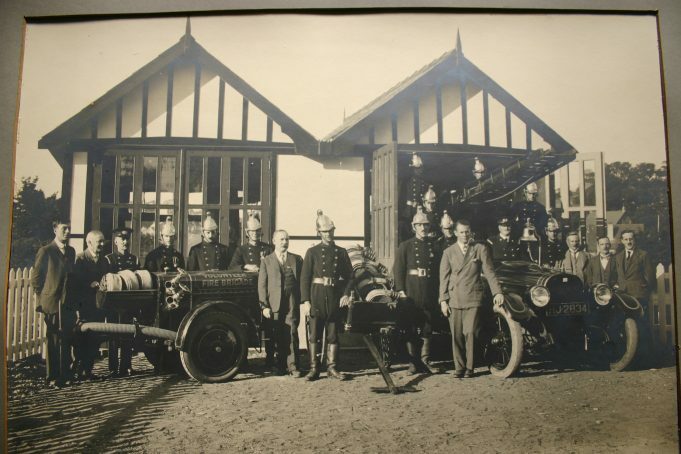 By the mid-1920s he had become Chairman of the Fire Brigade Committee under the auspices of the Parish Council, and was responsible for the founding and development of South Benfleet Volunteer Fire Brigade. Alec Johnson had vivid memories of its early days. “The Chief was a Captain Shepherd. What his qualifications were I do not know, but he had a very big house at the top of Vicarage Hill, and he owned a large butcher’s shop in Southend. The rest of the crew consisted of local tradesman who could drop everything at the sound of a maroon and rush to the station to man the appliance. There was Ted and George Land, who acted as drivers, followed by O.I.C. Powell, deputy Chief and local restaurant owner, then Wally Bingham, Cyril Downer, Fred Clough and someone called Edwards… now memory fails me. The original appliance was a hand-cart, which carried the hoses, and for the life of me I cannot remember any sort of pump. However, under Dad’s guidance, a large Chevrolet car was purchased and converted for use as a fire engine. A trailer pump was towed to the fire, water being obtained from any convenient source – horse trough (yes we had one of those) duck-pond or ditch. The intake was filtered by a wicker basket affair attached to the suction pipe, thus assuring an uninterrupted supply of water, and a fair chance for the creatures in the pond. The crew were summoned by the firing of a maroon, a large and noisy rocket, usually fired from the station by Ted Land. It was rumoured that it was his habit to light the fuse at the gas stove in the kitchen of The Anchor public house (where he lived), dash across the yard and set it up on the launcher at the fire station – a very hazardous trick! I never saw him actually perform this feat but privileged as I was by Dad’s exalted position, I was frequently present when an alarm was received. The Fire Station had a recreation room attached, and with its bar and billiard table, formed a club which, by courtesy of Dad, I was able to enjoy on Sunday mornings. With luck, I sometimes rode on the engine. I guess I was only about five or six at the time. I can still vividly recall the thrill of excitement engendered by the maroon! A long drawn out “woosh” as the rocket streaked into the sky, then a pause before the shattering boom of the explosion. One of the duties performed by the brigade was to give a display of their skills at the annual fete. This event took place in the Anchor Meadow, on which the fire station happened to be situated. In effect they were the “home team”, and teams from adjacent authorities came to the fete to compete for various trophies. This formed the backbone of the entertainment, but it was supported by many other displays by various organisations – Boy Scouts, Girl Guides, and not forgetting the local riding club. The whole field was of course encircled by a large number of side-shows and games of chance, designed to extract as much money as possible from the crowds. All profits went to the local hospital. By the early 1930s Walter had turned his attention to other aspects of village life and had become Chairman of the Open Spaces Committee of the newly formed Benfleet Urban District Council. As one of its first acts, the new Council had purchased an area of land for public recreation consisting of “The Downs” and “an exceedingly charming plantation” a little to the north called “The Spinney”. 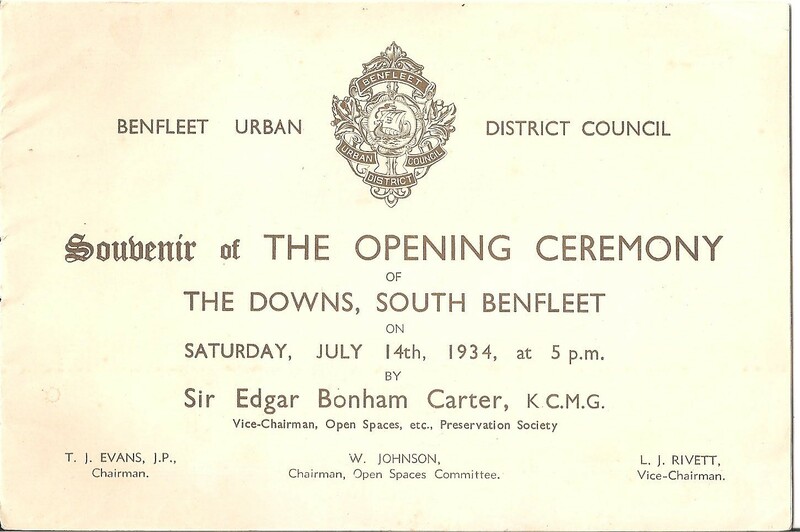 According to a brochure prepared for the public opening of The Downs on July 14th 1934, the land had originally formed part of an ancient homestead called “Suttons “. 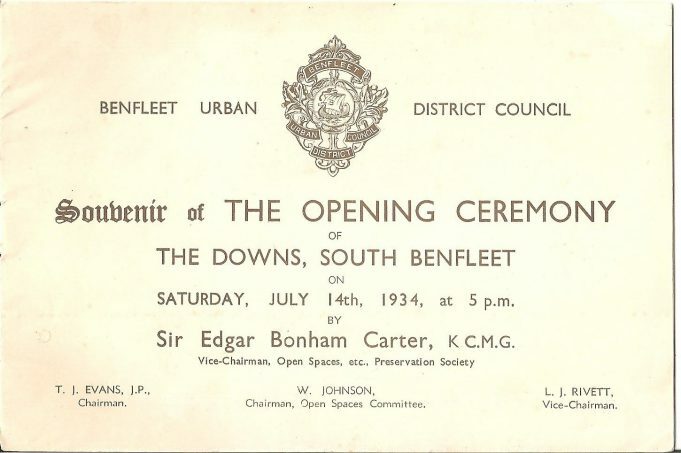 The ceremonial opening of The Downs began at 5.0 p.m. on a fine Saturday evening, when Walter Johnson and the Council Party met Sir Edgar Bonham Carter K.C.M.G at the gates located then, as now, at the top of School Lane, which despite having been the original Saxon road to Canvey Island was still unmade and heavily wooded. The gate was officially opened, and the company then proceeded to a dais where, after the customary speeches, Sir Edgar declared the Downs open to the public in perpetuity. There followed a hymn from the church choir, a dedication by the Vicar, and a rendition of God Save The King, accompanied by the Hadleigh Colony Salvation Army Band. 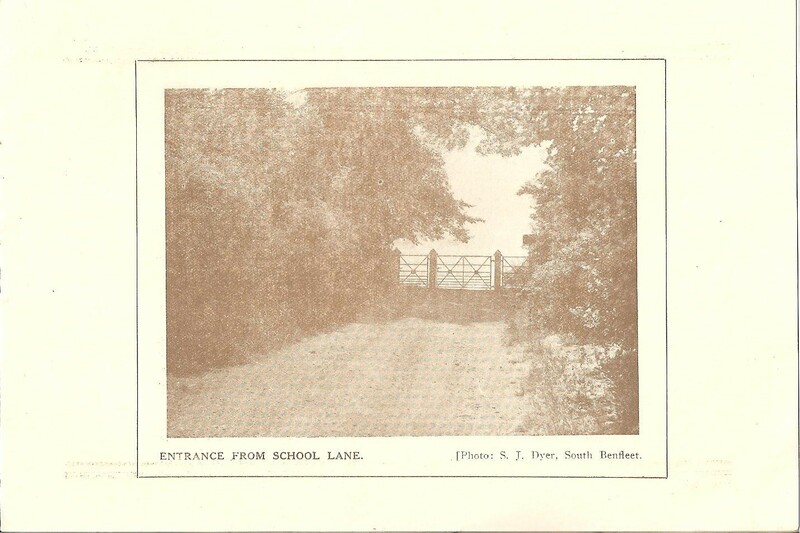 After the outbreak of war in 1939 the Johnson family moved briefly back to East London, but they soon returned, and Walter continued to be closely involved with village affairs during the war years. He was Chairman of the Council in 1946, and during this period he was probably associated with the acquisition of a new tenor bell for the church as a “Thanksgiving for Victory”. At any rate he was presented with a small bronze hand bell, which I have still, in commemoration of this event. 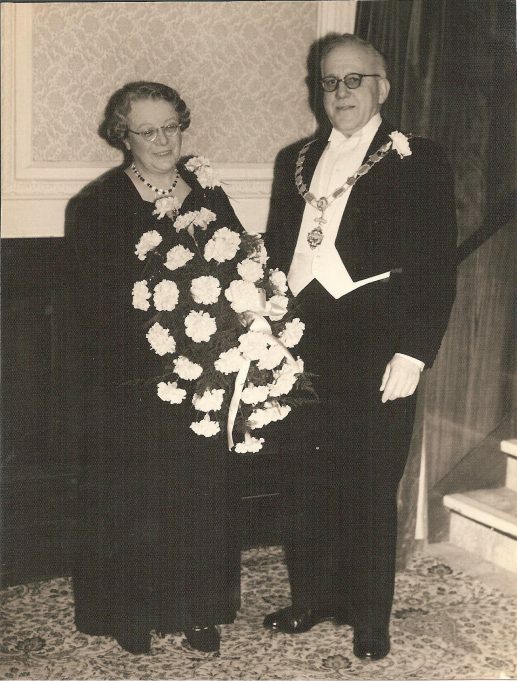 He continued to work for the Council, though now as an employee, for a number of years before his retirement, and he died peacefully at home in Benfleet in 1967. South Benfleet Volunteer Fire Brigade members outside the station - September 1926. Councillor Walter Johnson can be seen far right in the photo. 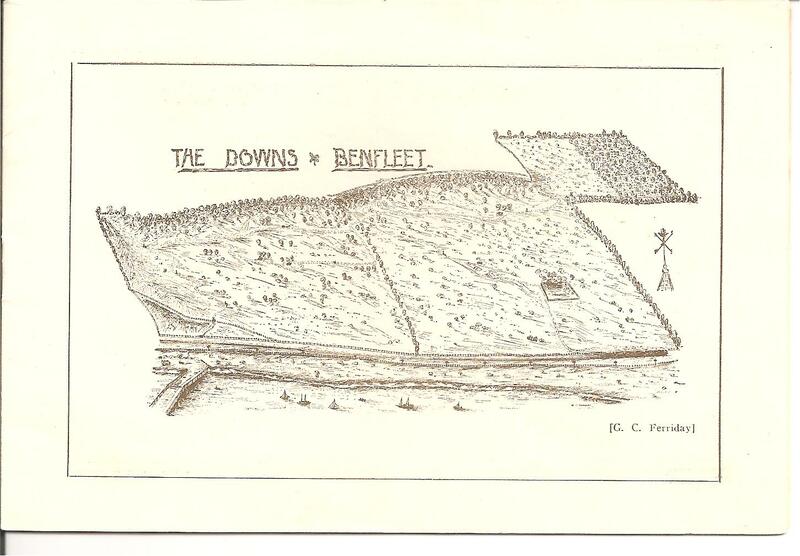 A sketch map of The Downs from the souvenir programme. The original gates to The Downs in 1934.